The simple cotton vest… classic, easy-going and versatile. It’s the perfect summertime knit. Several of my knitting students requested this workshop, so here it is! 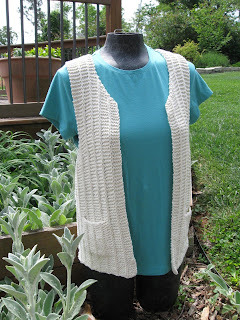 We''ll be knitting a simple vest, a basic ingredient in everyone's wardrobe. The ribbed slip stitch pattern and side vents provide interesting details that make this piece enjoyable to knit and fun to wear. This vest has a casual style and can be worn open or the pattern provides an example of a top button closure. Students will learn how to add a lined pocket to their vest as we work with soft cotton yarn. For this vest, we'll use Cotton Supreme by Universal Yarn. Students will select their colorway and the yarn will be available at the workshop. Cotton Supreme is a smooth and sumptuous worsted weight cotton yarn. A dream to work up, this yarn comes in a wide selection of vivid solids that will show off the texture of the stitch pattern. Machine washable and dryable, Cotton Supreme softens as it washes—making it a great choice for this versatile summer vest. When knitting garments, one of the primary factors (in addition to your gauge swatch) is having current measurements so you can get a good fit. We'll have two meetings devoted to taking measurements and working the calculations for fitting. If you are interested in joining me for this knitting workshop, contact me at veronicaquilts@gmail.com.